Modern Folk Music Twisted and Turned Inside Out. It’s well documented I’m not a big fan of Folk Music; not unless someone does something brand new or very interesting – not for me ‘finger in the ear sea shanties;’ so when a friend introduced me to the delights of Gilmore and Roberts in a local pub a few years ago I left intrigued and remain so. The young couple throw down their marker with first song Cecilia; using a traditional Folk format but adding Appalachian and Indie-Rock filters; making it a gloriously interesting four and a half minutes. Later balance/imbalance has all the hallmarks of something Richard and Linda Thompson would hope to create if they ever got together; with Katriona and Jamie sounding slightly unworldly with their darkly atmospheric harmonies on a Gothic Folk song. Both have stunning voices and their guitar and mandolin playing is extraordinary for ones so young; and their influences are only used sparingly on the album, as it’s their own slightly quirky flourishes that makes all the difference. Warmonger is a great example as it sees the pair siphoning World Music through an energetically powerful song that will have people talking about it for years to come. The production here is pitch perfect and crystal clear; using multi-layered instrumentation alongside Gilmore and Roberts exceptional voices to crystallise a set of intelligent stories/songs. Conflict Tourism closes with a beautiful song featuring Katriona; Ghost of a Ring could have been a Sandy Denny song; but it’s not and I’m left bemused that this young couple are still virtually unknown but can create such wonderful compositions. 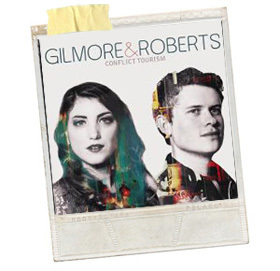 Gilmore and Roberts have moved on leaps and bounds since I fist saw them; and with Conflict Tourism they now stand head and shoulders above all of their contemporarys and I expect to see them headlining much bigger venues very, very soon.